This beautiful glass pendant from Diamond Tech will look like it is store-bought when you're done making it. 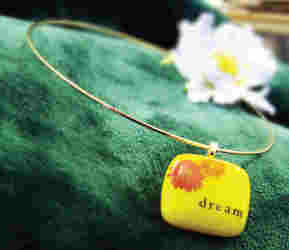 It makes a unique necklace, or you can use a shorter chain for a trendy bracelet or anklet. Fuse using the chart below. When firing is complete, open microwave and using Hot Mitts, carefully lift the kiln lid enough to inspect the glass. If your decal appears as a white silhouette, continue fusing at 15 second intervals until the white disappears.Remove kiln from microwave using the Hot Mitts and place on a heat resistant surface. Cool the kiln for at least 40 minutes with the lid on. Removing the lid or peeking under the lid during the cooling will result in your piece cracking. Glass remains hot for a long time and should be handled with great caution. Cool your kiln completely.